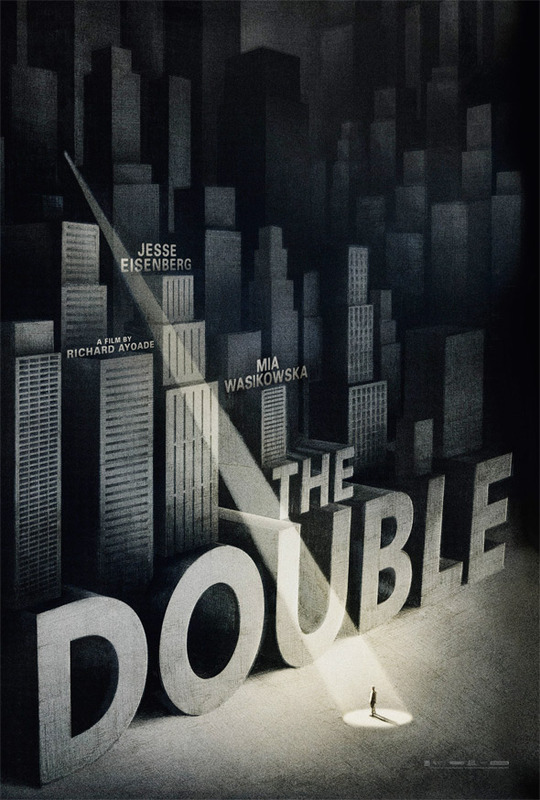 One of the many indie films we really think deserves to break out this year is the latest feature from British filmmaker/actor/comedian Richard Ayoade, a funky dystopian sci-fi dark comedy based on Dostoyevsky's The Double, starring Jesse Eisenberg. The film premiered at TIFF last year and we've been promoting it with reviews, trailers, interviews and plenty of other posters in the past, but this new poster is the best one yet. This new UK poster for The Double has a very minimalistic, artistic feel to it, like it was hand-drawn. A single ray of light shines down across a city on one man. It's impressive, and I'm glad it's an official poster. Check out this latest poster for Richard Ayoade's The Double, direct from IMPAwards via Live for Films. The Double is directed by Richard Ayoade (watch our TIFF interview with him here) who co-wrote the script with Avi Korine (brother of Spring Breakers director Harmony Korine), based on Fyodor Dostoyevsky's The Double: A Petersburg Poem. The film follows Jesse Eisenberg as Simon, who arrives at work only to find an exact double of himself has usurped his tenuous position in the company. Routinely humiliated by his boss (played by Wallace Shawn), the neurotic Simon now has to deal with a doppelgänger that is everything he isn't: confident, charming, successful, superficial. Mia Wasikowska and Noah Taylor also star in the film which played at London, Toronto and Sundance before hitting the UK April 4th, and the US on May 9th. Now THAT's a movie poster. Glad to see a studio actually putting effort into their print promotion.